Paw Print Genetics - I want one-stop genetic screening. Do you offer a test for von Willebrand disease? No bones about it, being a great dog breeder is tough work! Picking dams and sires, health testing, monitoring heat cycles, caring for pregnant dams, vaccinating and deworming, and promoting and selling your puppies are just a few of the many tasks one must accomplish to be a top notch breeder. One task that has historically been overly complex and time consuming for some breeders is getting genetic testing performed on their dogs. In the past, this often meant sending samples off to multiple laboratories to get testing performed because it was unusual for canine genetics laboratories to offer all of the tests needed under one roof. In addition, this situation meant filling out multiple submission forms, obtaining proper samples for each lab, and in some cases, waiting for several weeks for results. When Paw Print Genetics opened the doors for testing in 2013, it marked the beginning of the end for what I have termed the “multi-laboratory genetic testing dilemma” that most dog breeders were used to. Now, with over 140 genetic tests in well over 200 breeds, Paw Print Genetics has made a commitment to make canine genetic testing more convenient, user-friendly, and more affordable. One important genetic disease test that Paw Print Genetics is excited to now offer is for von Willebrand disease type I (vWDI). The addition of this test to our ever expanding test menu means that many more breeders will be able to get all of their genetic testing performed using one laboratory; thus, fulfilling one of Paw Print Genetics’ goals to support the needs of those involved in breeding healthy dogs. vWDI is a disorder characterized by a mutation in the VWF gene and a subsequent inability to produce adequate amounts of a protein known as von Willebrand factor (vWF), which is important in blood clotting. Though spontaneous bleeding with this type of von Willebrand disease is rare, many cases are identified due to excessive bleeding associated with trauma or at the time of a routine spay or neuter. In rare cases, the bleeding in vWDI patients can be life threatening. The mutation causing vWDI is inherited in an autosomal recessive manner, meaning that dogs typically have to inherit two copies of the mutation (one from each parent) to show signs of the disease. The mutation causing vWDI is believed to be a mutation of ancient origin. This assumption is based on its presence in the genomes of multiple, unrelated breeds, suggesting that the mutation existed in the canine population prior to creation of the breeds we currently recognize. As pure breeds were established through selective breeding for certain desirable traits, the mutation for vWDI hitched a ride in the genome and became fixed in the individual breed lines, similar to many other disease causing mutations of purebred dogs. Dogs with vWDI will often live normal lifespans despite their increased risk of bleeding episodes related to injury or surgery, but medical and behavioral precautions are often needed to prevent excessive bleeding. Two other, more severe forms of von Willebrand disease, called von Willebrand disease type II and type III (vWDII and vWDIII) also occur in dogs due to different mutations in the same, VWF gene. Like vWDI, these two types of the disease are also inherited in an autosomal recessive manner. vWDII is characterized by a decrease in the size and quantity of vWF proteins found in normal animals, making platelet adhesion and aggregation at wound sites much less effective. In vWDIII, there is a complete absence of vWF; thus, making this type the most severe of the three types. Dogs affected with vWDII and vWDIII are much more likely than vWDI affected dogs to suffer from spontaneous bleeding episodes, resulting in frequent bruising and nosebleeds. Deaths of dog affected with vWDII and vWDIII have been reported due to internal bleeding after mild trauma or spontaneous bleeding episodes. There is significant variability in severity of clinical signs associated with all three types of von Willebrand disease. Since von Willebrand disease may not be diagnosed until a traumatic event or surgery (especially types I and II), affected dogs often reach breeding age and pass along the mutation to offspring prior to diagnosis. Genetic testing of dams and sires prior to breeding allows for affected dogs to be removed from the breeding pool. In addition, it allows for identification of carrier dogs which should only be bred to dogs with two normal copies of the gene in order to prevent producing affected pups. At Paw Print Genetics, we will continue to listen and adapt to the needs of our clients in a sincere effort to facilitate the process of creating genetically healthy dogs. Though we don’t currently offer every genetic disease test for every dog breed, for many breeds we have firmly established ourselves as the go-to laboratory to make the ordering process easy and efficient. Von Willebrand disease type I- Australian labradoodle, Bernese mountain dog, Cardigan Welsh corgi, coton de Tulear, Doberman pinscher, Dutch partridge dog, German pinscher, goldendoodle, Irish red and white setter, Irish setter, kerry blue terrier, labradoodle, Manchester terrier, miniature poodle, papillon, Pembroke Welsh corgi, stabyhoun, standard poodle, toy poodle, and West Highland white terrier. 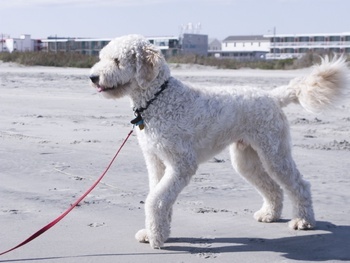 Von Willebrand Disease type II- Australian labradoodle, German short-haired pointer, German wirehaired pointer, goldendoodle, labradoodle, miniature poodle, rough collie, smooth collie, standard poodle, and toy poodle. Photo Credit: Goldendoodle standing CC courtesy of lyrandian on Wikimedia Commons.